Data loss doesn't have to be catastrophic. The most common cases of data loss are limited to data corruption on the storage devices, while the hardware in the computer remains fully functional. With the right software tools and the right approach, you can restore your data quickly and cost-effectively without calling in an expensive consultant or disassembling any equipment. The R-Studio Network Package is a set of powerful data recovery tools that are effective enough for an enterprise setting but intuitive enough for use by any technician with a working knowledge of systems administration. The key is to use the right tools and take immediate, appropriate action while avoiding common mistakes that can cause further or permanent data loss. R-Studio Network and our detailed Data recovery guide provide you everything you need to safely get your data back fast. No specialized technical knowledge or PC disassembly required. It's usually easy to identify at least the approximate cause of logical data damage: a botched operating system upgrade, a power outage, or an interrupted data transfer. When these events happen, it's almost certain that you are facing a logical failure, rather than a hardware problem. This is true even if your computer no longer boots properly. This is good news. It means your data is still there, even if the system is unbootable or the hard drive can't be recognized. In these cases, it's the filesystem or metadata that has been lost, which means that a typical operating system no longer knows how to find your data. But R-Studio Network can. Stop using the drive immediately. When data has been corrupted or accidentally deleted, writing new data to the drive vastly decreases your chances of recovering your files. Installing software and attempting data recovery writes new data to the drive. Even starting a machine writes new data to the drive, since a variety of boot processes, logs, and cleanup actions occur upon booting. Start the recovery process as soon as possible. Don't delay data recovery, especially for systems that remain online - even if idle - after data loss. Background processes and normal computer use may permanently overwrite your data. Do not attempt a software data recovery for a physical failure. In rarer cases, data loss is caused by hardware failures. If the hard drive or storage device itself has mechanical failures, then data recovery becomes much more risky and challenging. Simply attempting to access the drive can cause additional, irreversible damage. If you suspect hardware damage, do not attempt data recovery. Instead, bring your drive to a data recovery specialist who can use specialized tools to analyze and salvage the data without causing further damage. Causes of hard drive failures include power surges, overheating, shock (e.g. dropping a laptop), electrostatic discharge, or simple wear and tear. Erratic behavior, intermittent read/write errors, and clicking sounds are precursors of mechanical hard drive failure. The R-Studio Network Package provides a unique and powerful method for restoring data that mitigates some of the inherent risks of data recovery while eliminating some of the typical challenges. In an ideal setup, R-Studio Agent is pre-installed on the client machines that are victims of data loss, while R-Studio Network is installed on a different computer on the network. This allows data recovery to commence immediately after a data loss event without having to install new software or configure the target machine. The recovery is performed as if the technician were working directly on the target machine, but the entire process is controlled by the remote computer with R-Studio Network installed. For unbootable machines, R-Studio Agent Emergency can be used. 1. Fast access to the target machine. Time is of the essence when it comes to data recovery, and getting started quickly increases the chances of a successful recovery. 2. No setup or installation required. Writing data to a hard drive can cause further data loss. With R-Studio Agent pre-installed, this risk is removed. 3. Full access to hard drives and storage devices without physically removing hardware. Hard drives can be technically or logistically difficult to access. Also, IT equipment is often sealed by vendors, and breaking the seal may void the warranty. With network data recovery, this isn't necessary. For multi-site enterprises, this allows centralized IT departments to perform data recovery from any location. 4. Data recovery from RAIDs and complex storage networks. Physically removing devices and attempting to virtually rebuild a RAID or storage network on a data recovery machine can be difficult, if not impossible. With R-Studio Network, data recovery can be performed directly on these systems. For our corporate clients, we offer an R-Studio Network Package that allows you to implement this concept at a significantly reduced cost, when compared to buying multiple R-Studio Network licenses. Our corporate R-Studio Network Package allows you to purchase a single R-Studio Network license for the primary data recovery machine and receive five R-Studio Agent or R-Studio Agent Emergency licenses for no additional charge. The figure below shows a typical network layout and illustrates how you can use R-Studio Network and your five R-Studio Agent licenses to effectively protect yourself from data loss. Depending on your network environment, you can choose R-Studio for Windows, Mac, or Linux when you order your package. They are the same in their functionality. R-Studio Network doesn't require a dedicated workstation; it can be run on any suitable machine, for example, a sysadmin's computer will do. Using the program, you can perform both local data recovery from directly connected devices, or remote data recovery from other computers where R-Studio Agents are running. As with R-Studio Network, these can be R-Studio Agents for Windows, Mac, or Linux depending on your network environment. Each R-Studio Agent edition works with any R-Studio Network edition. For example, you can use R-Studio Network for Linux on the recovery workstation to recover data from a target machine with R-Studio Agent for Windows installed. You may also use R-Studio Agent Emergency for network emergency data recovery in adherence with the license provisions discussed below. Additional licenses can be purchased separately, if necessary. The R-Studio Network Package may not be used for commercial data recovery for hire. You need to buy the Technician license if you want to start a data recovery business. Licenses are not transferable. Once installed and registered, neither R-Studio, nor R-Studio Agents can be removed from one computer and installed on another. The overall number of installed R-Studio Agents (including R-Studio Agent Emergency) should not exceed the number of obtained agent licenses. For example, if you want to remotely recover data from a computer on the figure that doesn't have R-Studio Agent running, an additional license is required. In this instance, you could not remove the Agent from Windows Server I and install it on another computer to perform data recovery. You may, however, remove a hard drive from a computer and connect it to the R-Studio machine and recover the data locally. 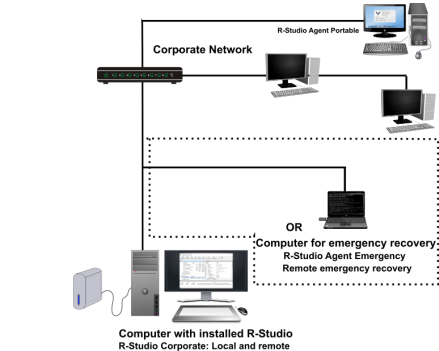 R-Studio Agent Emergency may be used on any computer with R-Studio Agent installed on it. If you use all five of your R-Studio Agent licenses, then you must purchase another license to use R-Studio Agent Emergency on another machine. However, if you have at least one spare license for R-Studio Agent, you can use it for emergency recovery on any computer. If you use all five R-Studio Agent licenses, you may use R-Studio Agent Emergency for emergency recovery only from those computers where R-Studio Agents were installed. If you have at least one spare license for R-Studio Agent, you may use it for emergency recovery on any computer. For example, if you would have reserved the #5 license instead of installing it in the Windows Workstation in the figure, you would be able to use this license to perform emergency data recovery on any machine, even if it did not have R-Studio Agent installed on it. This article provides an overview of the R-Studio Network Package and a typical network layout. For examples of a network data recovery, see our articles Data Recovery over Network and Emergency Data Recovery over Network.